Tuberculosis can infect the lungs, but it can also affect the intestines. It is a chronic disease of the walls of the intestine, which are characterized by tubercle deposits. Common manifestations of the disease are in the form of single tubercles, ulcerations and clumps of tubercles. Its symptoms are almost similar to Crohn’s disease. Intestinal tuberculosis can affect any part of the gastrointestinal tract. The most commonly affected part is the ileocecal region in the right upper quadrant. GI tuberculosis is mostly found in developing or underdeveloped countries. People with tuberculosis of the intestine are susceptible to HIV infections. Ulcerative form :These are multiple superficial ulcers restricted to the epithelial surface and a very active form of the disease. Hypertrophic form :These thicken the bowel wall creating scarring and fibrosis. It has a rigid appearance and looks like a carcinoma. Ulcerhypertrophic form :This is a combination of ulcerative and hypertrophic forms. There are two types of conditions causing intestinal tuberculosis; primary and secondary. Primary can be due to direct intake of infected food and secondary could be due to any other tubercular infection into the blood stream. Prolonged pulmonary tuberculosis can cause complications of the intestine. Blood tests: These help in detecting elevated levels of transaminases, ESR and detects anemia. Tuberculin skin tests :This is a standard method of detection of mycobacterium tuberculosis infection. Biopsy :A polymerase chain reaction or PCR test is done to show sensitivity and specificity levels. Radiographs :Imaging of the abdomen, upper GI series, barium enema, computed tomography and ultrasonography of the abdomen are done. Colonscopy and endoscopy :These are done with biopsy and sent for a culture test. It is usually difficult to differentiate between intestinal tuberculosis and Crohn’s disease. 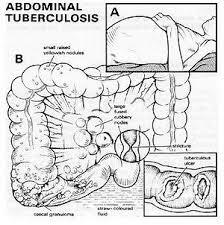 Abdominal tuberculosis will require confirmation before treatment. ATT (Anti-Tuberculosis treatment) for 6 – 9 months is necessary for cure. At time surgery is required to relieve bowel obstruction.